Full Disclosure: Matthew O'Malley, the designer of Knot Dice, is a friend of mine and as part of the review process, Matthew furnished me with a set of 18 Knot Dice to play with. In addition, I am working on developing games using these components. However, since they're also a component system, having designed with them allows me to talk about using them as components, which is important for the review. Who should buy Knot Dice? Anyone who likes quick, compelling games; anyone who wants a fascinating set of components for design; or anyone who just loves beautiful dice. 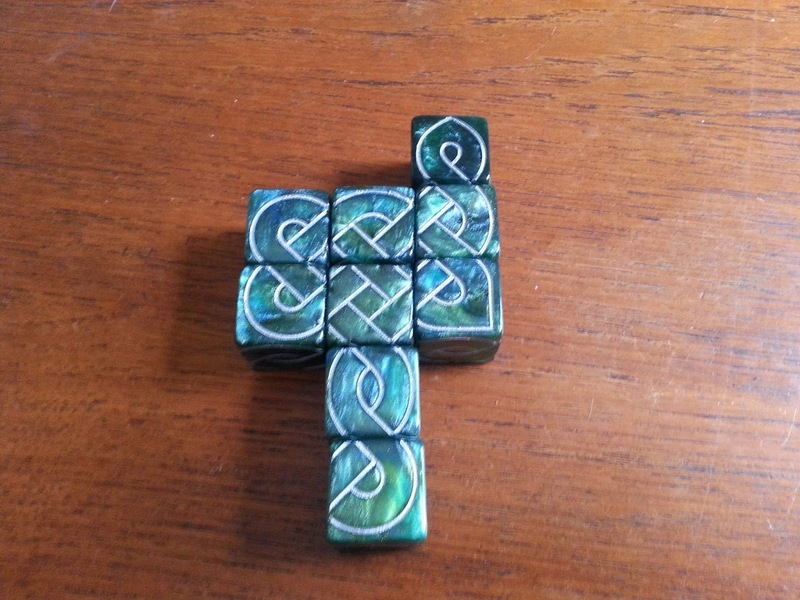 The major difference between Knot Dice (the upcoming project from Matthew O'Malley of Black Oak Games) and most games is that Knot Dice is a component system more than an individual game, with games and sets of puzzles available on his website. 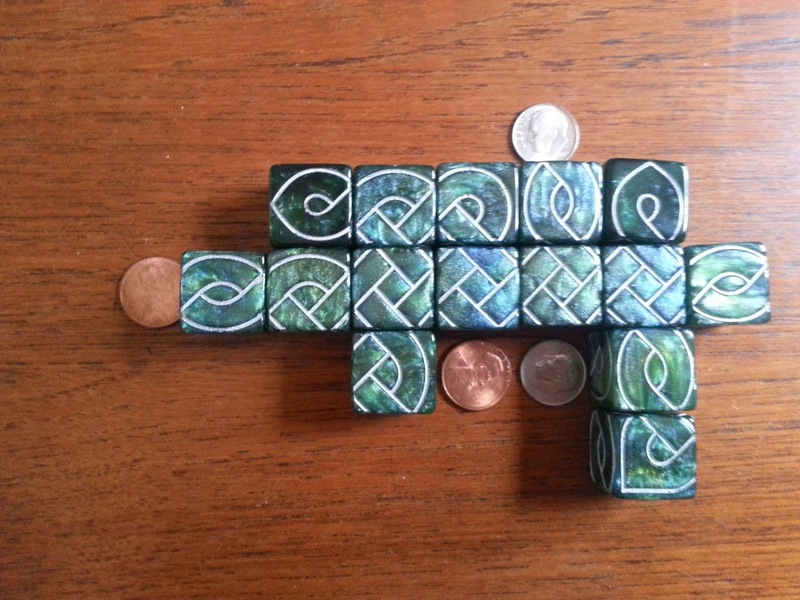 Knot Dice functions - and functions well - on three different levels: as a set of games, as a component system, and as art. And they're worth the cost as any of those three alone. Those are the dice, and that's my mantle. As components, Black Oak Games has a hit, too. There are surprisingly rich possibilities opened up by these 18 dice, which a quick look at the list of games on his website will reveal. Having spoken with Matthew, I know more are on the way. As a designer, the possibilities that Knot Dice open up are wonderful. I have at least three games percolating thanks to these dice - and at least two projects that I've pushed to the side in favor of noodling around with Knot Dice. The most obvious way to use the dice is to create knots, trying to get the right faces to close off the dice. They can also be used to create paths along which items could travel or for the number of connections that each face opens up. As I said, they are exceptionally rich in possibilities for designers. But, most of you will probably be interested in the games. Because the rules for the games are available on his website, I'm not going to run you through them. Rather, my intent is to review these games, discussing the rules only when necessary - and then briefly. While these were prototypes of the game, the dice are already absolutely gorgeous. They're a marbled green color, and each face features one of six parts of a knot, as shown below. 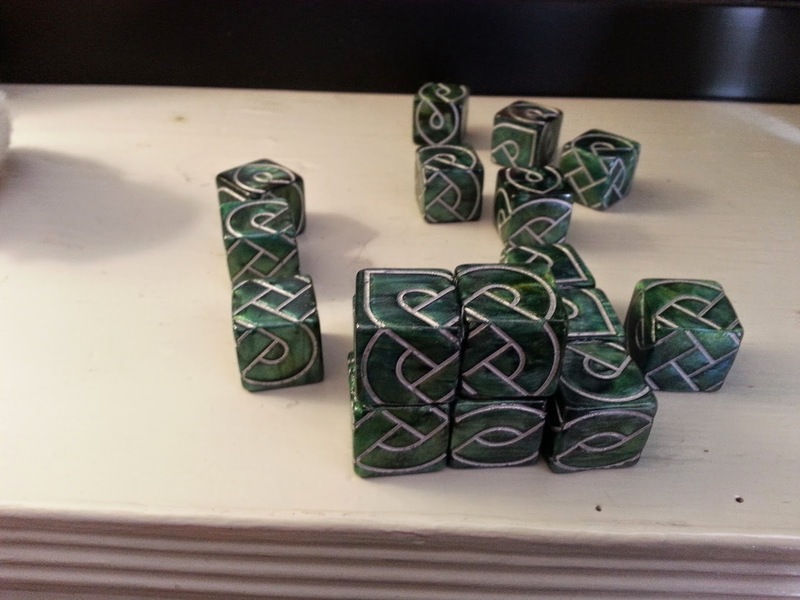 All six sides of the Knot Dice. While I can't say too, too much about the quality of the final components, if they're as nice as the prototyped dice, they'll be phenomenal. I would gladly pay the $29 he's asking for a set if they were of the same quality as they are now. The games that Black Oak Games can be broken down into two categories: puzzles and games. As different as they are, I'll consider them separately. Currently on the Black Oak Games website, there are sets of puzzles, some of which ask you to transform an existing design and others of which ask you to create an arrangement that meets certain conditions, such as a 2x2x2 cube where the visible faces from a contiguous knot. I am not a fan of puzzles. I would rather peel the stickers off of a Rubik's Cube and stick them on in the right places than solve it. Nevertheless, I thoroughly enjoyed these puzzles. And while I'm not capable of evaluating if there are puzzles that are sufficiently challenging to entertain serious puzzlers, I can definitely vouch for there being excellent beginner puzzles that were challenging without being frustrating for even my modest skills. And, I can vouch for there being puzzles that I have not yet been able to figure out. 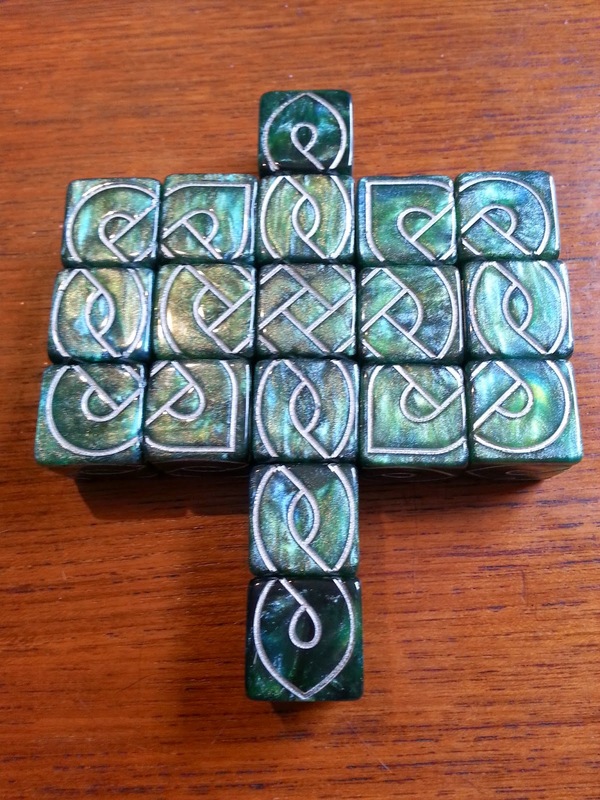 A game of Kells, a great, quick co-op game using the Knot Dice. Using dice in a game inevitably introduces randomness, and for some players, that's a turn off. For me, I like randomness, but only in one way. Dice, in my experience, can be used in two ways: to randomize setup or to randomize outcome. The first creates experiences that I want to keep returning to; the second does not. In Knot So Fast, the speed game, the dice are used in the second way, to randomize the outcome. But, each round is fast, and as players earn more dice, they're slowed by having to make a knot with more dice. Still, this game is more luck than skill. While I find it to be a good way to introduce people to the dice, it's not a game I'm likely to keep coming back to myself. Still, I've enjoyed the games of Knot So Fast that I've played - and my fellow players have as well. I just like other games with Knot Dice better. 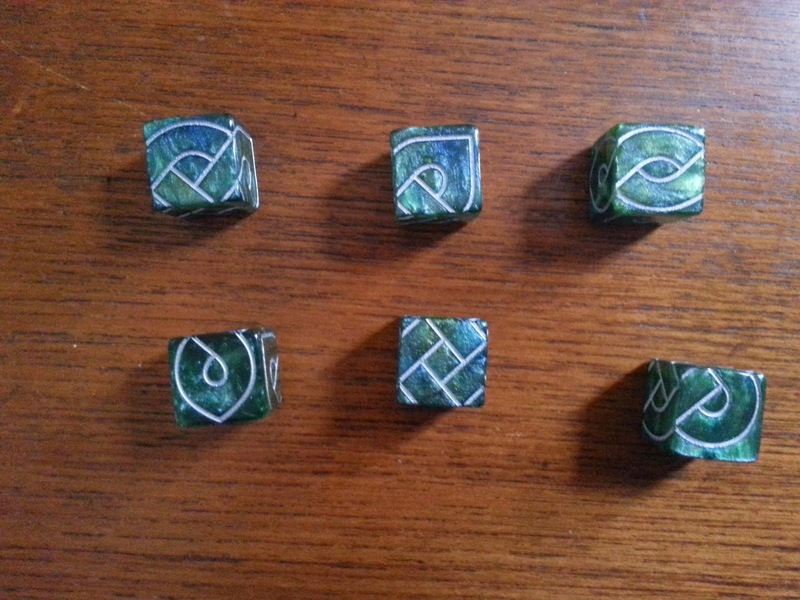 Besides, art should be enjoyed, not part of a rushed experience, and these dice are art. I'd rather play Kells (image a few paragraphs up), a co-op game where players to start with randomized dice, then make decisions from there in an effort to make a completed knot as a team. Unlike some co-op games, it moves quickly. The decisions, while present, are not the kind that will induce analysis paralysis. Or, I'd rather play Distance (image below this paragraph), where players try to get tokens (representing siblings) as far apart as possible. What interests me most about this game is that tokens move along the strands of the knot, not simply along the dice. This, combined with the excellent balance between the randomness in the setup and the strategy in placing your dice, make this a game I'll be playing for years to come. Both Distance and Kells are light, fast, and fun - but still compelling, balanced, and strategic. A game of Distance, a competitive game using the Knot Dice. Doug Levandowski is a game designer who co-created Gothic Doctor. He has other designs in the works, too - because that's what designers do. When Doug's not designing, interviewing, writing articles, or sleeping, he's teaching English to a bunch of amazing high schoolers. They're working on Macbeth right now, which is his favorite play to teach. You can find him on Twitter at @levzilla.